Professor Jeff Karp attended the annual meeting of the Association for European Election Officials, 21-23 September, 2016 in Tirana, Albania. He presented the EIP Year in Elections to officials. Professor Pippa Norris gave a guest lecture on "Why American Elections are Flawed and How to Fix them". She was honored to receive the 2016 Brown Democracy Medal at the State University of Pennsylvania, 30th September 2016. Professor Pippa Norris visited the School of Public Policy and Governance at the University of Toronto on April 25-26 2016. 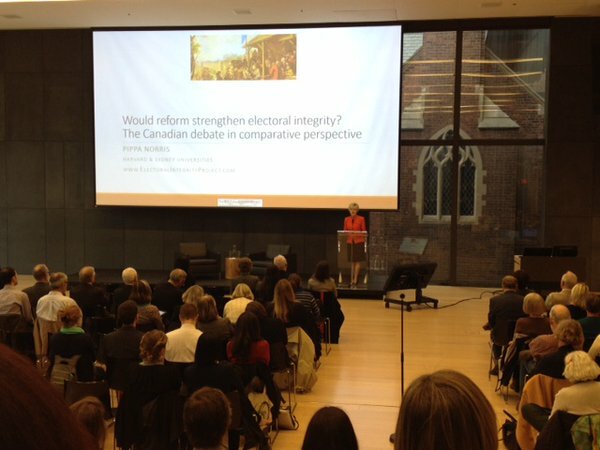 She gave the Cadario visiting faculty lecture on "Would reforms strengthen electoral integrity? The Canadian debate in comparative perspective." Dr Ferran Martinez i Coma speaking in Nairobi, Kenya in a conference from 26-27th July 2016 organized by the Hanns Siedel foundation on "Electoral Integrity in Africa: Emerging Issues in African Nations." Dr Alessandro Nai and Mr Max Groemping presenting their research papers in a panel on electoral integrity at the European Consortium of Political Research (ECPR) General Conference in Prague, 7-10 September 2016.